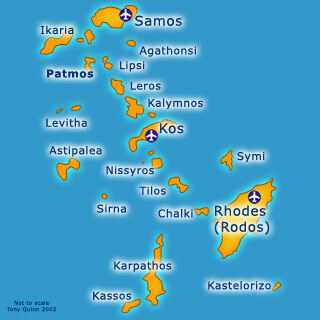 Map of the Greek Islands, featuring Patmos, one of the Dodecanese group of the Islands of Greece in the Aegean. Where am I? 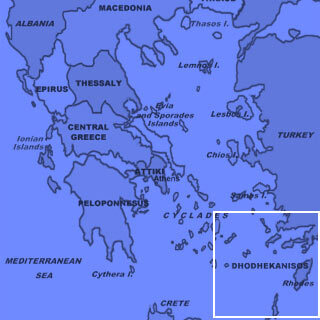 - take a look at our maps of the Greek Islands. Agrolivado beach "...We think its popularity may lie in the fact that it has hit a good balance in providing facilities for visitors, but without spoiling its essential attractiveness: for instance, there are sunloungers and parasols, but only on half the beach..."
Kambos Beach "...Here, you can find a number of tavernas, along with hire facilities for windsurf boards, sailing boats canoes, pedalos, and paragliding. It is also one of the few beaches with sunlougers and parasols..."
Psili Ammos beach "...There is a daily boat from Skala port, the 'Afrodite' which will bring you to the beach and moor up for the day. The boat sails at about 10 am daily, subject to sufficient demand...."
Our original virtual tour map of Patmos, Greece - maintained by popular demand! About Red Door VR Limited (Publishers of VR Patmos). Red Door VR Limited are a UK company specialising in 360º panoramic tour photography with over 1,000 panoramas on line!! We produce virtual tours, supply equipment, software and hardware. We are Authorised resellers for Nodal Ninja, GigaPan, PanoMAXX, Aputure, and other leading manufacturers of VR equipment for the UK and Europe.